If there is anything that drives Mumbai towards cricket, it is the cricket clubs across the city where the sport isn’t a mere game of bat and ball. From a person interested in cricket just for leisure to a professional cricketer, everyone in Mumbai begins their first step towards competitive side of the sport with club cricket. Sachin Tendulkar is no mere cricketer as the former player has been bestowed with the title of ‘God of Cricket’ by cricketing fans as well as pundits across the world. Tendulkar has been an inspiration to millions of cricketers including our former captain Mahendra Singh Dhoni. Before becoming the highest run-scorer in the history of cricket with 34,347 runs in his kitty, an 11-year-old Sachin represented John Bright Cricket Club, and in 1985-86, he played the whole season aged 12. Later, the Little Master went on to play for the Cricket Club of India (CCI). Every Mumbai cricket fan would know about this lad (pun intended) who has been a valuable addition to the Mumbai Ranji team. Throughout the 2017/18 season, Siddhesh Lad has scored 652 runs with a high score of 123 runs in seven matches and 12 innings. Lad smashed three centuries and three fifties with an average of 59.27 for Mumbai throughout the season. Playing for Mumbai, the 26-year-old has scored 3461 runs for his team with a consistent average of 44.37 in 46 matches. But his first claim to fame was as the captain of the Western Wolves cricket club in the Toyota University Cricket Championship in 2013. Shivaji Park Gymkhana is considered as the hub of cricket in Mumbai. Shivaji Park Gymkhana was born as the “New Maharashtra Cricket Club” – established in 1909 by Shri P. G. Marathe and his two brothers along with Shri S. P. Athalye, Shri L. M. Vaishampayan, Shri N. T. Kane, and others. Ajit Agarkar is considered as one of India’s best all-rounders. Agarkar was prevalent mostly due to his bowling abilities rather than batting. He is the third highest wicket-taker for India in ODIs, then the fastest to bag 50 ODI wickets, the fastest in terms of matches to complete a double of 200 wickets and 1000 runs. While his form throughout his career went hot and cold, he was a crucial part of India’s ODI squad. He was almost a regular member of Mumbai's Ranji squad and also led them to victory in the 2013-14 season. One of the best Indian left-handers to have ever played the game, Wadekar was an accidental discovery for Indian cricket. Wadekar was pursuing engineering and that’s when he impressed his college's coach as the twelfth man with his skills. Subsequently, he was promoted to playing leagues and ended up debuting for Mumbai in the Ranji Trophy in 1958-59. After receiving his national cap after eight years of playing domestic cricket, Wadekar established himself as a dependable player. However, the biggest feather in his hat, and what he's most likely to be remembered for, is his leadership in 1971 that took India to their first ever series wins in the West Indies and in England. Son of former cricketer Vijay Manjrekar, Sanjay Manjrekar was one of India’s crucial middle-order batsmen. He scored just over two thousand runs in Test cricket at an average of 37.14 while he played for India between 1987 to 1996. He occasionally played as wicket-keeper and was known for his technically correct batting style. Following the conclusion of his cricket career, he now works as a cricket commentator. Inarguably the best opener India has produced, Sunil Gavaskar was India’s most successful Test batsman before Sachin Tendulkar. A consistent player with a considerable grit, character, and defiance, brought about a revolution in Test batsmanship by playing unswervingly against some of the fiercest and intimidating bowling attacks of all time. 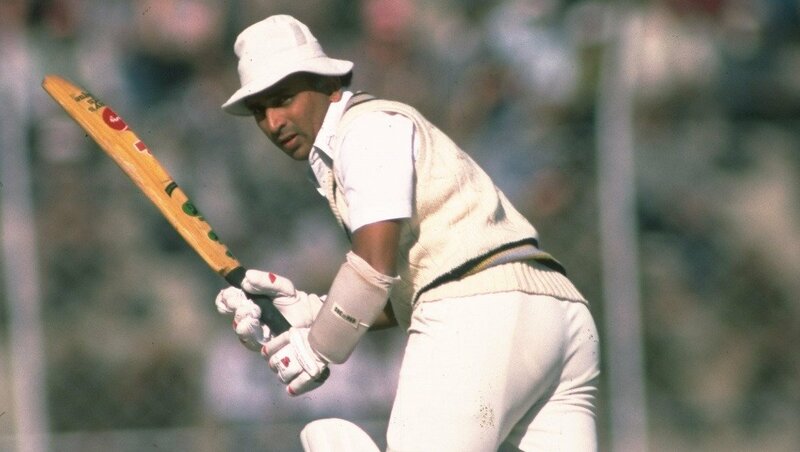 In an age of the fearsome and blood-thirsty West Indian pacers, Gavaskar had the courage to bat without a helmet and continued doing so for a period of 16 years, and displayed his class through the 10,000 runs that he scored for India. He held the record of 34 Test centuries for almost two decades before it was broken by Sachin Tendulkar in December 2005.